What Is DA Form 3955? DA Form 3955, Change of Address and Directory Card is a form used to assist service members in setting up a new mailing address at a new place of residence. 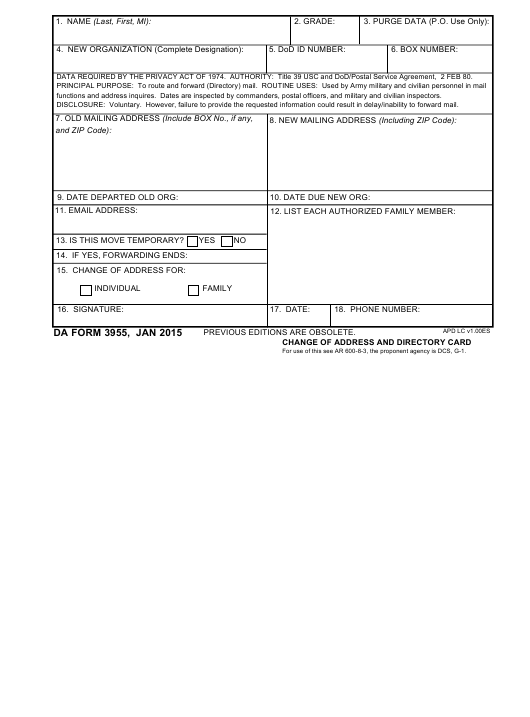 This form is used by Army and Civilian personnel in mail functions and address inquiries. The Department of the Army (DA) released the latest version of the form - often incorrectly referred to as the DD Form 3955 - in January 2015. An up-to-date DA Form 3955 fillable version is available for digital filing and download below or can be found through the Army Publishing Directorate website. The sponsor at the soldiers new location is tasked with contacting the post office and completing the DA Form 3955 to obtain a mailing address for the soldier to start forwarding the mail to. If any mail is received before the soldier's arrival, that mail will be held on to until the soldier arrives. If the soldier is delayed en-route, they must inform the sponsor, who in turn must notify the post office so that the soldier's mail is not returned to the sender. How To Fill Out Da Form 3955? DATA REQUIRED BY THE PRIVACY ACT OF 1974. AUTHORITY: Title 39 USC and DoD/Postal Service Agreement, 2 FEB 80.
functions and address inquires. Dates are inspected by commanders, postal officers, and military and civilian inspectors. DISCLOSURE: Voluntary. However, failure to provide the requested information could result in delay/inability to forward mail. 13. IS THIS MOVE TEMPORARY? For use of this see AR 600-8-3, the proponent agency is DCS, G-1. c. Old post locator, or APO, if overseas. d. New post locator, or APO, if overseas. e. Correspondents who write you regularly. MAILING ADDRESS" box on the reverse). Boxes 1 through 6 are for personal identifying information. The top line of the form is for name and grade of the soldier and for the purge data, if applicable. Then next lines require the name of the new organization, a Department of Defense (DoD) ID number and a box number. Box 7 is for the old mailing address of the soldier, including a box number, if any, and a ZIP code. Below is the box for specifying the date of soldier's departure. The new address with ZIP code should be provided in Box 8. Below this box is a line for specifying the date of arrival to the new organization. Box 11 is for the soldier's email address. All authorized family members should be listed in Box 12. Box 13 should contain the information on the status of the soldier's move. If the move is temporary, Box 14 should contain the date when the forwarding of the mail must end. Box 15 should indicate whether the new mailing address will apply to the soldier only or if it will become the new address for the whole family (specified in Box 12).